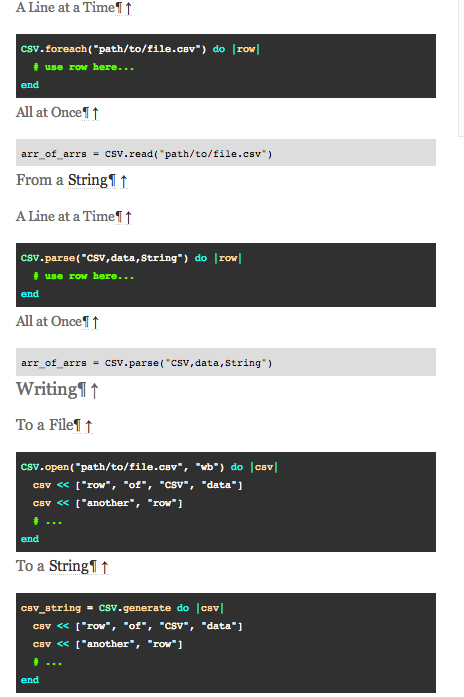 Ruby CSV write to a file – Gotcha! The ruby csv library requires quite a bit more typing, and the documentation for it is easy to misunderstand. One of my primary needs, is often data wrangling. Changing the contents of a csv file for use in another framework, whether it’s reverse coordinates, stripping unwanted columns, or adding needed columns to the data, and I always trip up on how to dump the changed CSV after manipulating it. Author Ashley RaiteriPosted on July 22, 2013 April 16, 2015 Categories bigdata, code, rubyTags code, csv, rubyLeave a comment on Ruby CSV write to a file – Gotcha!